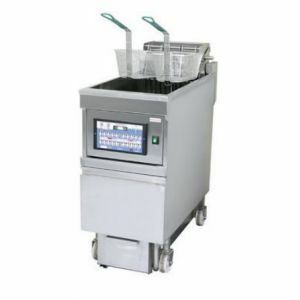 "Deep fryer for fast food market. Main characteristics: ∙ Two independent semiautomatic basket lifts (basket is fixed on the holder, timer-button is pressed, basket easily lowered manually and locked in the down position, after a specified time basket rises automatically); ∙ Six independent timers with snooze and backlight (backlights each timer that had been selected and turned on); ∙ Cold Zone; ∙ Electronic temperature holding control system with adjustable regulation; ∙ Drain tank for oil with the filter holder (manually filtering possible) and wheels for easily removal ∙ Wide drain cap (to avoid barrage) ∙ Lifting heating elements (easy and convenient wash) ∙ Magnetic cover of the electronic block with a frame for the established values of the timer (you can change it by yourself)"
Fryer equipped with built-in oil filtering system that can be activated on one click. 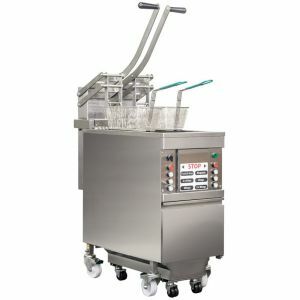 Operating capacity 25 liters. Manual lifting mechanism for heaters is provided to ease maintenance. Large cold zone (1.7 liter). 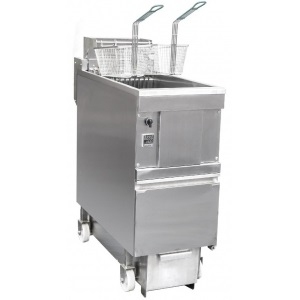 Baskets made of high grade stainless steel. The unit comes with 10 replacement filters.